The Chevrolet Corvette has always been America's sports car, but this next example takes it to the ultimate level. It puts the Jamin' in Benjamin Franklin, the Bert & Ernie in Liberty, and the Steal in Bald Eagle. This is the most American thing to drive on a road since the Sherman Tank. Find this 2002 Chevrolet Corvette Z06 offered for $21,900 in Florence, KY via craigslist. Tip from FuelTruck. People choose to express their patriotism in different ways. Some decorate their homes, while others try to build the biggest fireworks extravaganza they can muster. 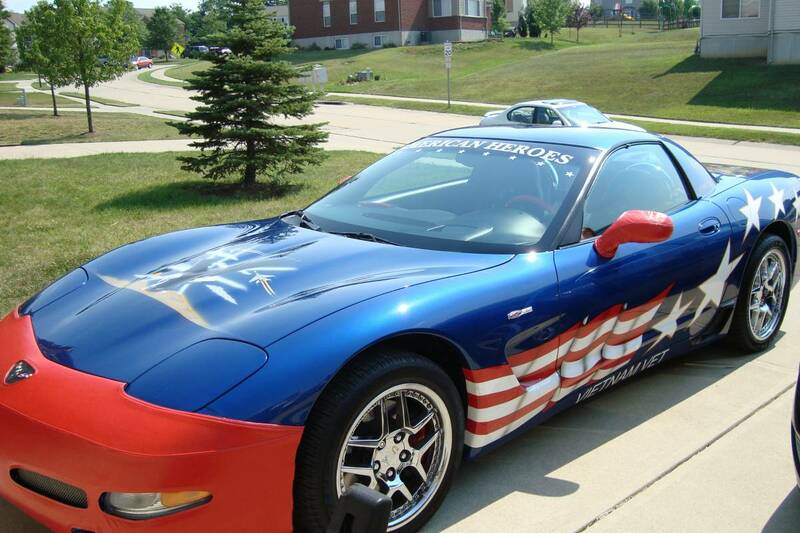 Expressing patriotism means commissioning a custom Chevrolet Corvette. The car has just over 16,000 miles on the odometer. The previous owner said he was inspired to have the car made after the terrorist attacks on September 11, 2001, and airbrushed homages to America adorn the custom Corvette Z06. The text on the back of the car reads "Let's roll," a phrase used by one of the passengers of United Airlines flight 93 as they decided to re-take the plane from terrorist control. 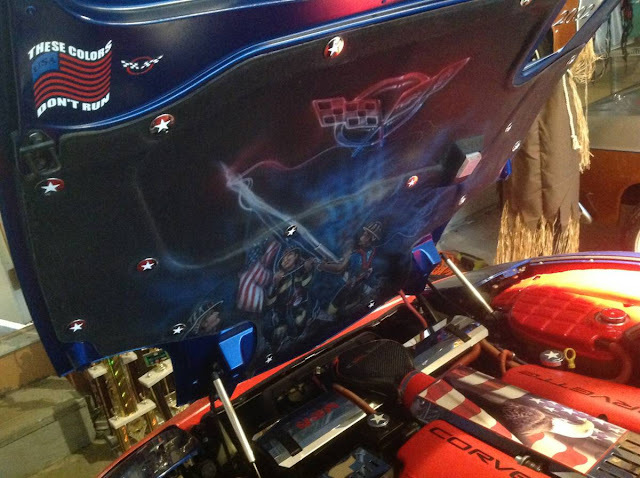 Under the hood is an airbrushed copy of the iconic photo showing the American flag being raised over the rubble of the twin towers. Each of the branches of the US military is represented on the back end of the car, and the hood depicts an eagle and fighter planes flying over the desert. The engine cover of the Corvette Z06's 405-horsepower V8 is also signed by Adrian Cronauer, who served as a military radio host during the Vietnam War and was the inspiration for the Robin Williams movie Good Morning Vietnam. This corvette is often asked to participate in parades with the car, and those have been some of his fondest memories with the Corvette. We have a sound system specially made to play music out of the Corvette's trunk during parades. We have entered many car shows with the Corvette and has won a slew of awards. The asking price for this Corvette is $21,900. 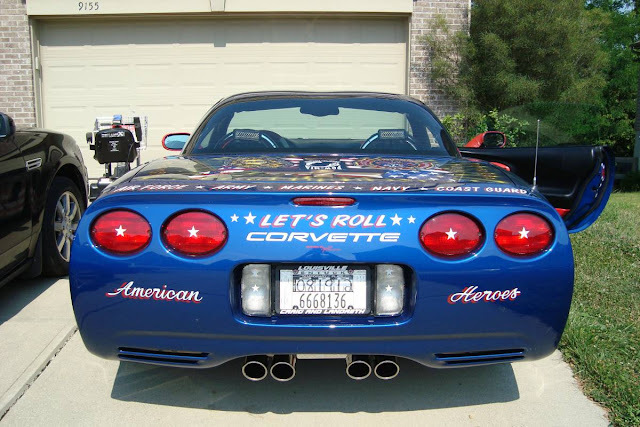 This is no normal 'Vette, and it can be difficult to place a value on heavily customized cars - particularly when it comes to displaying your patriotic pride. We are the second owner of this car. We are selling because our children are getting older and we no longer have time to show the car. We have won over 150 awards including cash. This car deserves a home with someone who will cherish it. I have had offers from dealers, however, I would not feel right selling this car to a dealership. This car is located in Florence KY. I will not ship this car. If you are interested, please contact me through email or phone. I will try to answer any questions you may have. Once again, the asking price is $21,900. I will consider any serious offer. I will also consider trade offers with cash. You may also google 'american heroes corvette' for more photos. Also, I am familiar with all types of scams so don't waste your time. Thanks for looking. I am always suspicious when people are overtly "patriotic" if thats what you call this. Perfect deep cover for the terrorist...who would possibly suspect such a "patriotic" "American"? I would. I would love to look like Macho Man Randy Savage and drive this to the gym everyday. I am the new happy owner. Flying to KY tomorrow to pick it up and drive it across country. And Woodie Man, I am a true patriot and Army veteran. Did you ever serve our country?